In Fall 2014, incoming Freshman Claire Bertram was looking for an interesting elective and signed up for NMIX 4200: New Media and TED. As the only first-year in the 4000-level course, Claire was uncertain what she had gotten herself into — but that was only the beginning. Before Claire had even completed the course, the NMI realized we had found ourselves a keeper. Claire joined the NMI as a Program Assistant in Spring 2015 and embarked on a 3-year term as the TEDxUGA Student Council President. There is no argument, Claire’s influence, dedication, and contagious charisma have shaped both TEDxUGA and the NMI over the last 4 years. She has made a lasting impact on us, an impact that has rippled across campus, earning her the recognition she so deserves. We’re thrilled to announce that Claire is a recipient of the 2018 UGA Presidential Award of Excellence, a prestigious award given to less than 1% of the graduating class from each college and school. 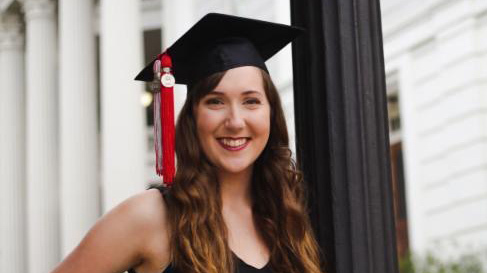 In just a few days, Claire will graduate as an Entertainment and Media Studies major, and while the NMI will not be the same without her, we’re so proud of her accomplishments and can’t wait to brag about her future feats. Congrats Claire!